The evening started with two tastings from the Antipasti menu. 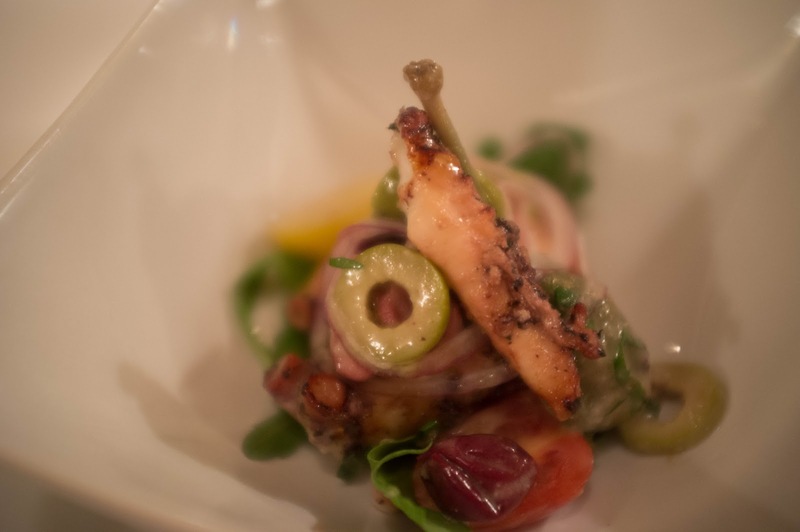 First, Polp ai Ferri- grilled Mediterranean octopus with tomato, caper berries, olives, arugula and red onions. The octopus was tender and I loved the saltiness that the green olives and caper berries brought to the dish. 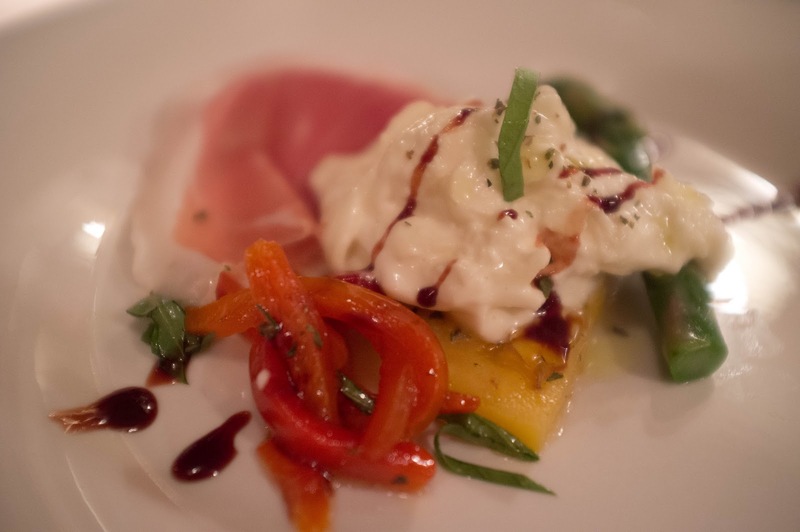 The second antipasti was the burrata with roasted peppers, asparagus and prosciutto. The mozzarella is freshly imported and incredibly creamy. A perfect way to start off a traditional Italian meal. In true Italian fashion, it was now time for the pasta course. 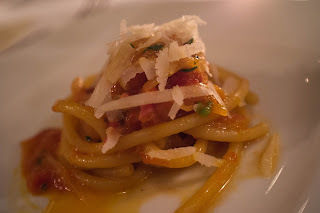 From this section of the menu we got to try the Bucatini alla Matriciana, a wonderfully al dente pasta served with San Marzano tomato sauce, smokey imported pancetta, and freshly grated Pecorino Romono. Having glanced at the menu ahead of time, I was really hoping to get to try the Risotto ai Frutti di Mare: super fine arborio rice with jumbo lump crabmeat, lump diver scallops, shrimp, and calamari. I was not disappointed and was very pleased with this dish. 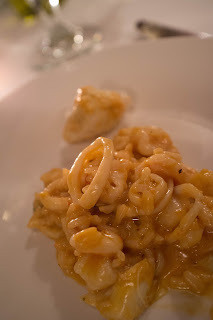 We also got to try two fish dishes as part of this tasting menu. 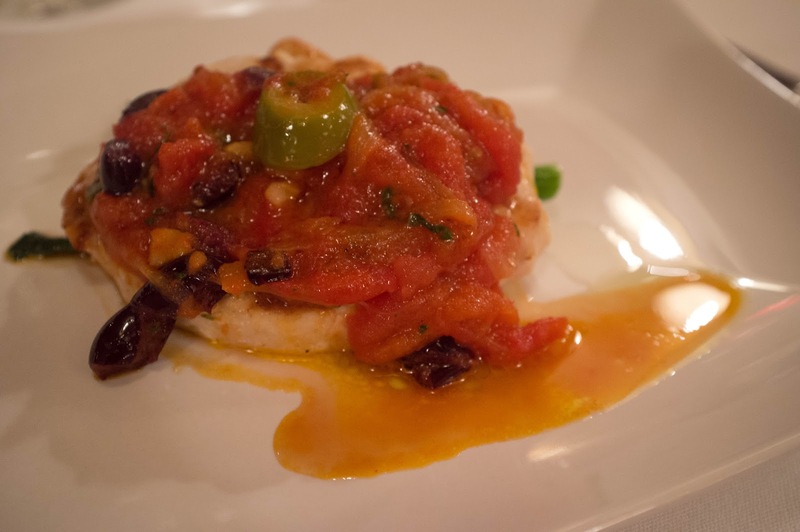 The first was the Pesce Spada Livornese, another very Mediterranean influenced dish of swordfish with olives, capes, onions and tomato sauce. 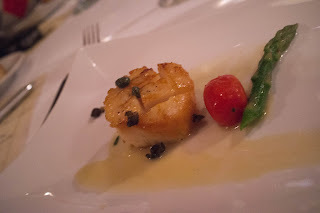 The second fish selection were the pan seared diver scallops served with caper berries and a lemon and white whine sauce. Perfect in it's simplicity. To end the savory portion of our evening we got to try the Petto D'Anatra- pan seared duck breast with bartlett poached pears in a dry vermouth sauce. 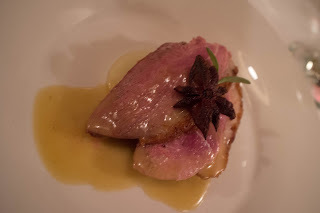 I loved how the sweetness of the pears complemented the duck. To end this decadent meal, we got to try not one, but two selections from the dessert menu. 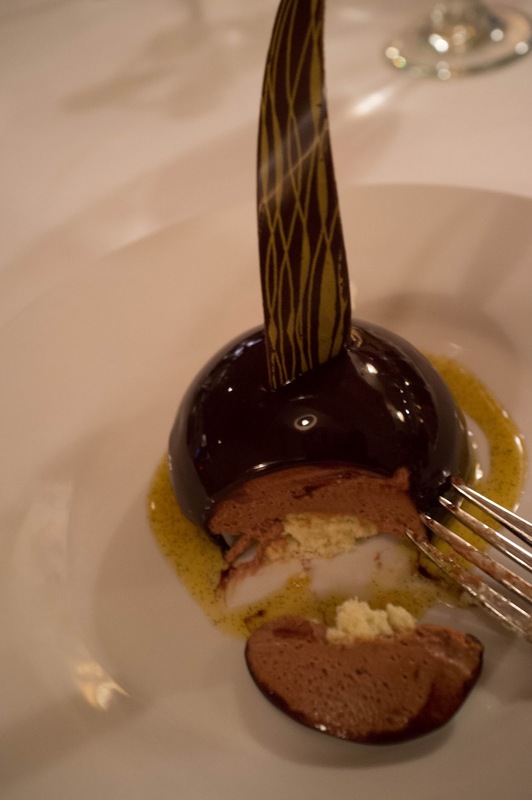 The elegant Zuccotto is a three chocolate and passion fruit mousse cake. I really enjoyed how the tartness of the passion fruit helps offset the rich chocolate. Then it was time for the piece de resistance, the baba. It's served with the rum and Marsala wine on the side, so that you get to control how much goes over the sponge cake. I of course, took Chef Lello's expert opinion and used the whole glass. 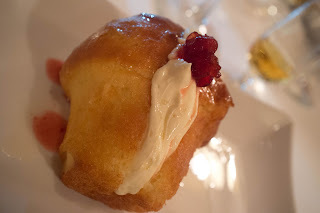 Despite the fact that this cake is filled with a Mascarpone cheese custard, this dessert was surprisingly light, which was really appreciated considering how much I had eaten at this point! 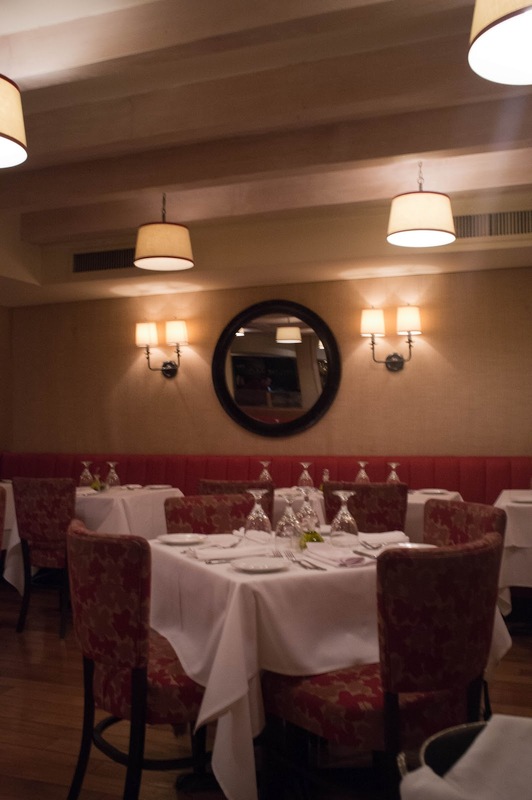 Fiorini is a great neighborhood spot for simple, authentic Italian food made with the highest quality, fresh ingredients. A great place to relax and enjoy your meal at a leisurely pace with good company.